After a long absence from the US auto market, Alfa Romeo has come back to the states with three very solid cars in the last couple of years – the crazy fun, but highly impractical 4C, the excellent handling and well-executed Giulia (and its bonkers Quadrifoglio variant), and now the Stelvio – the company’s first ever SUV. The Stelvio is a true crossover, inheriting many positive aspects of its sedan cousin in a vehicle that offers a bit more space and utility. It’s not trying to be an off-roader or a rugged utility vehicle. It’s more like the modern day equivalent of a station wagon, and that’s fine by me. 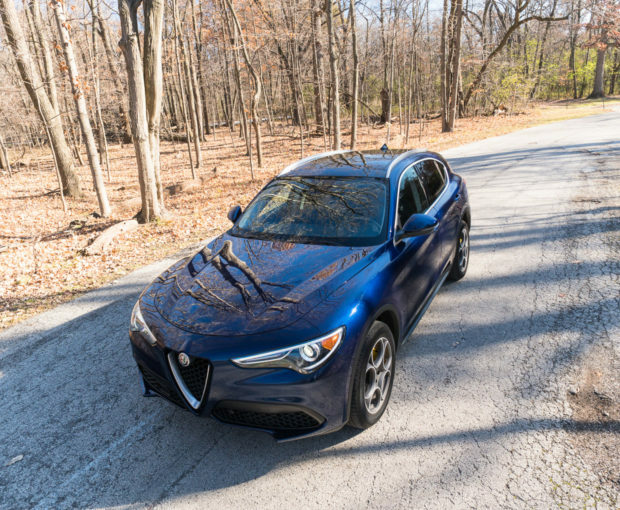 By not trying to overextend themselves into the off-road world by increasing ride height too dramatically, or adding skid plates and the like, the Stelvio manages to retain much of the sporty feel of the Giulia. 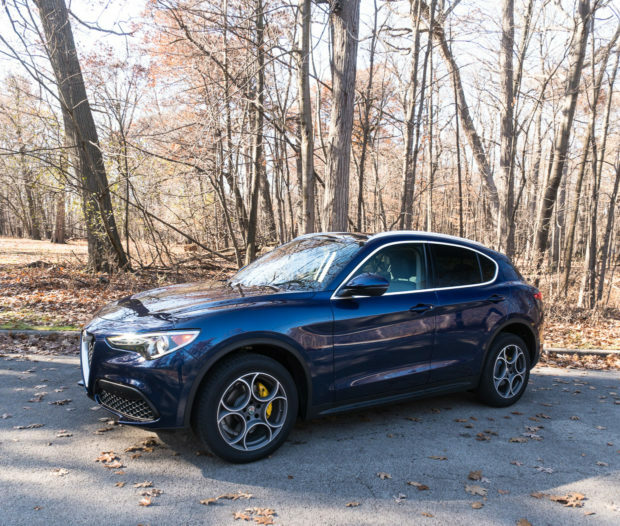 The Stelvio has a curvaceous, athletic design that can go head to head with the Jaguar F-PACE and Porsche Macan any day. 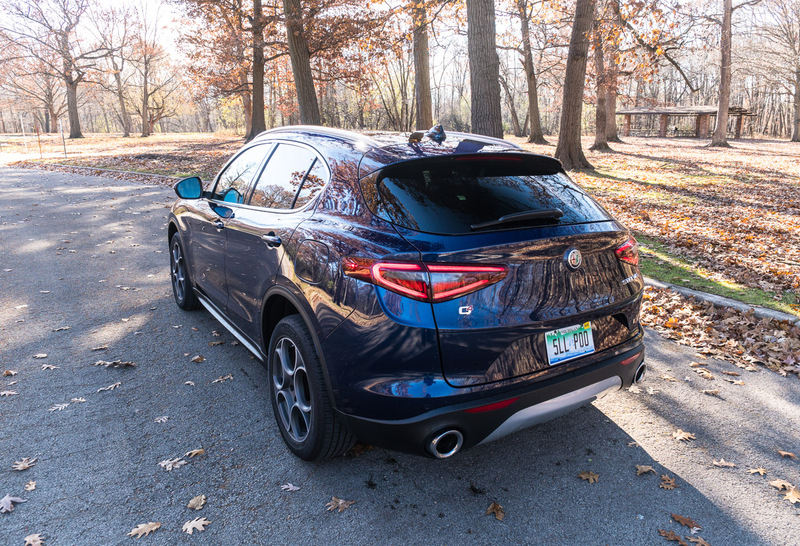 From the trademark Alfa triangle grille and dramatically styled headlamps, to its large dual exhaust ports, and smoothly integrated rear spoiler, it’s a good looking car, no question about it. I’m particularly fond of the upgraded 19″ aluminum wheels which replace traditional straight spokes with a circular pattern. Plus, the rich and sparkly Montecarlo Blue metallic paint must be seen in person to be appreciated. Photos don’t do it justice. At the moment the Stelvio is only available in the US with one drivetrain – a 2.0-liter turbocharged 4-cylinder engine. But this is one of the most powerful engines of this size on the market, packing 280 horsepower, and an even more impressive 306 lb-ft. of torque. Its all-wheel drivetrain is more than capable of handling itself nicely on slippery roads, and helps to launch even the base model from 0-to-60 mph in just 5.4 seconds. If you absolutely must have more power, a Quadrifoglio version is coming sometime in 2018, rocking the same 2.9-liter turbo 6 found in the Giulia of the same name, and sure to be a blast to drive, what with 505 hp and a top speed of 177 mph. Like other ZF-sourced 8-speeds, the Stelvio’s automatic transmission shifts smoothly and quickly. Aluminum paddle shifters are available, though they were absent in my vehicle. Frankly, the transmission was so good at predicting my moves that I didn’t miss having them at all. Despite its whip smart acceleration, its engine is a relative fuel-sipper too. I managed to best its EPA fuel economy, turning in a 26 mpg average for my week of mixed highway and city driving, and averaged just about 30 mpg in strictly highway driving. 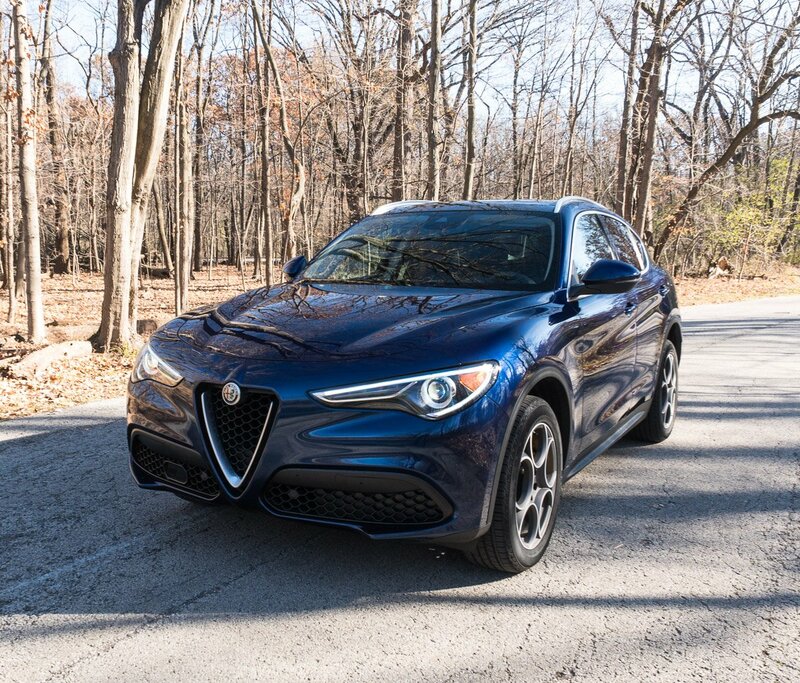 It doesn’t hurt that the Stelvio benefits from numerous lightweight aluminum elements in its chassis and body, along with a carbon fiber driveshaft. Auto stop/start is enabled by default, but I disabled this for the vast majority of my driving, as I generally find the feature annoying on all cars which have it. 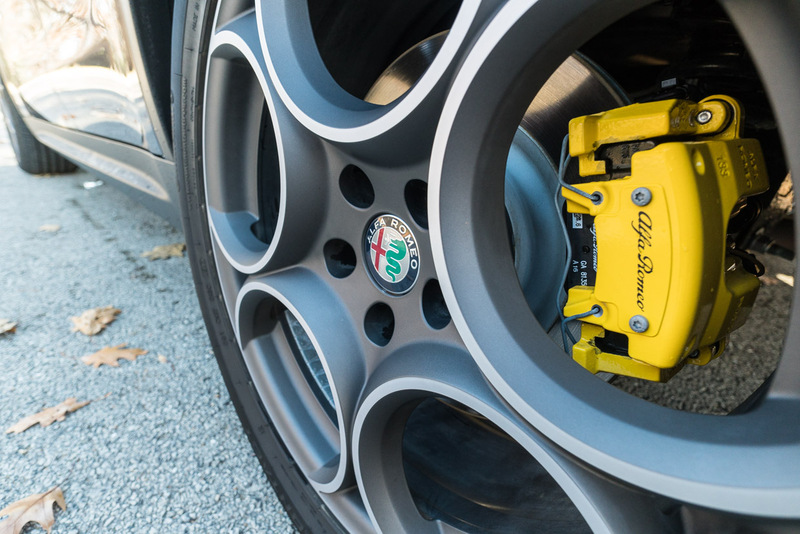 Since it does sit a little higher than the Giulia, and definitely doesn’t have the stiff sport suspension found in the Giulia Quadrifoglio, it’s handling and ride dynamics are definitely more daily driver than sports car. But the steering rack offers good feedback, and what the shocks give up in stiffness, they make up for in ride comfort. An optional Sport package includes a sport-tuned suspension among other things, so I’d definitely be curious to feel how much that stiffens up the ride. 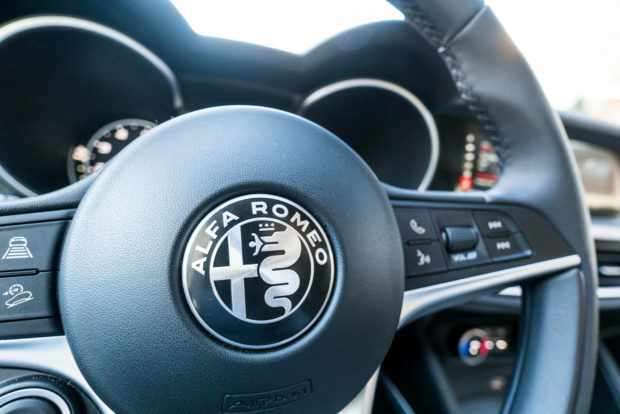 The Alfa offers three driving modes – Dynamic, Natural, and Advanced Efficiency, which offer variations to throttle mapping, acceleration, and steering feel. I didn’t find much difference between Natural and Advanced Efficiency modes, but Dynamic definitely holds gears longer and tightens up the steering, providing a more rewarding driving experience. That’s where I spent the vast majority of my time behind the wheel. While it drives really well, and looks great outside, the interior of the Stelvio isn’t quite as much of a hit. Aside from the leather seats, D-shaped steering wheel, and aluminum accents, the materials in use don’t feel particularly high end – especially the rather ordinary textured material used on the top of dashboard. On the plus side, the seats are comfortable and supportive, all controls are well placed, and their operation is intuitive. The base model Stelvio comes with a variety of standard tech, including a backup camera, rear parking assist sensors, remote keyless entry, pushbutton start (with a race car like placement on the steering wheel), power folding mirrors with heat, rain-sensing windshield wipers, cruise control, hill descent control, and a power rear liftgate. 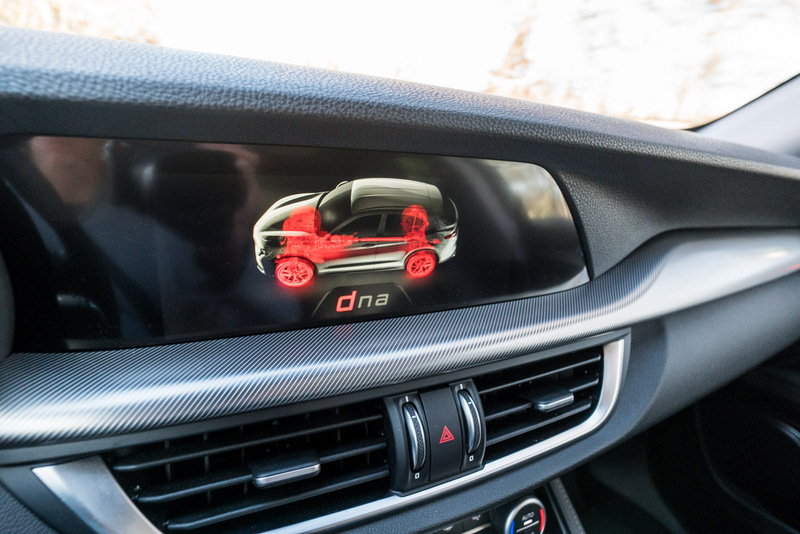 A 6.5-inch infotainment system is standard as well, and comes with an 8-speaker audio system. 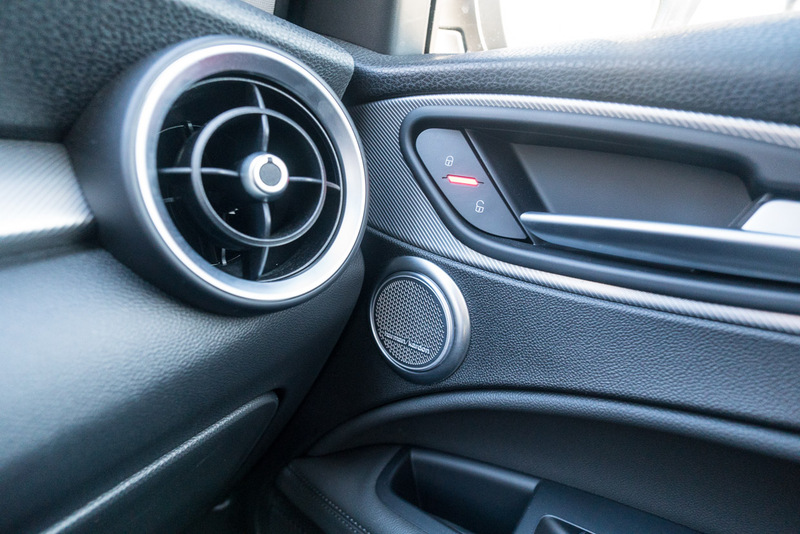 In the case of my review vehicle, it was upgraded with an 8.8 inch display, navigation, and a premium 12-speaker Harman Kardon audio system, which sounded very good indeed. I also recommend opting for the adaptive cruise control, which works great, and offers full stop and go functionality. One minor technical annoyance was with the front park sensors, which liked to scream incessantly at me even after I had put the car into park. Of course, the main reason you buy the Stelvio over the Giulia is the space and utility, and the Stelvio is right on its game in that department. 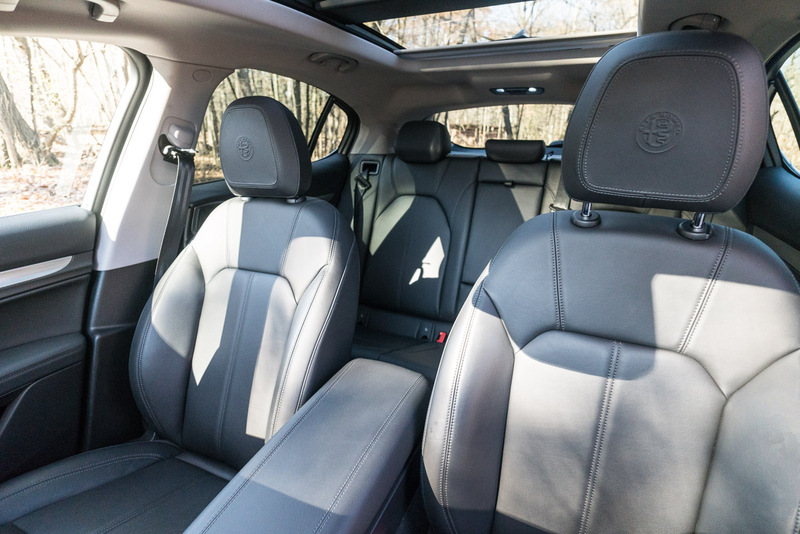 The rear seats offer enough headroom and legroom for 6-foot-tall adults, and the seats are comfortable enough back there for long trips as well. 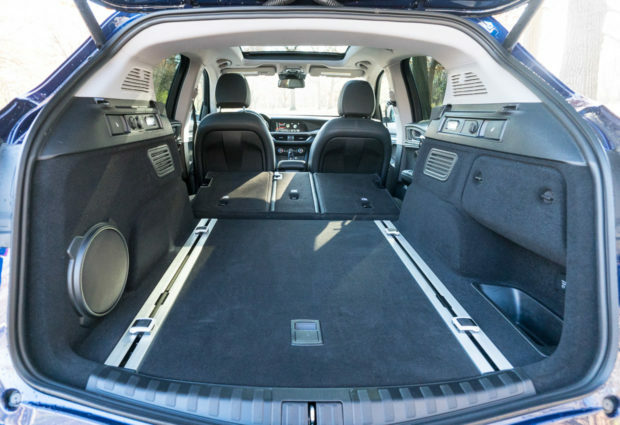 Those seats can also be folded in a 40/20/40 split configuration for versatility, and there’s 56.5 cubic feet of space available when the back row is flat. That’s right where you’d expect a mid-size crossover to land. Supposedly, there’s just 18.5 cubic feet behind the second row, but I’m convinced that number is wrong on the spec sheet. To me, the space seems to be right on par with other crossovers claiming numbers in the 30+ cubic foot range. There’s plenty of room in the back for groceries, suitcases, backpacks, and the like. There’s also a good sized bump-out on the right side which makes it easy to carry golf clubs. Much like the Giulia, the Stelvio is a very good car, especially for its first model year. It rides well, offers great looks, accelerates fast, has above average fuel economy, plenty of cargo space, and a comfortable interior. It’s competitively priced too, starting at just $41,995, putting it on par with the base Jaguar F-PACE, Audi Q5, Range Rover Evoque, and about $6,000 less than the Porsche Macan, and besting all of them in terms of power, acceleration, and fuel economy. 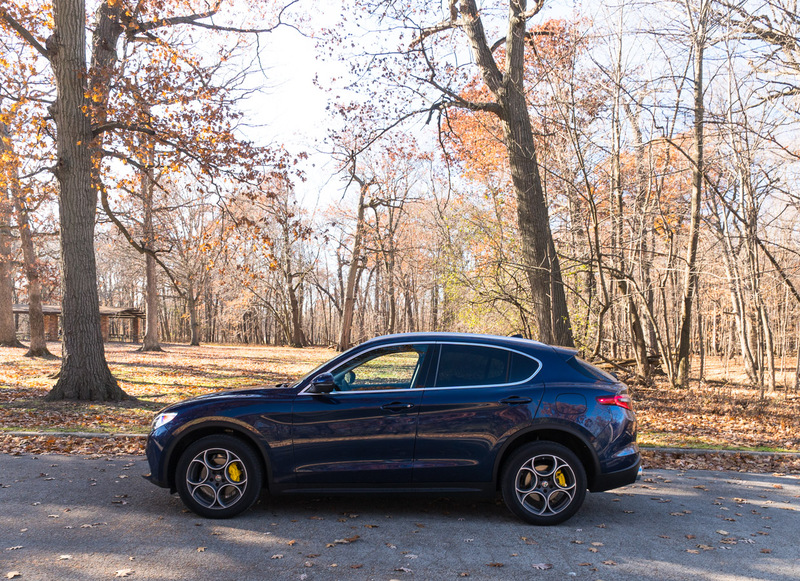 If you’re in the market for a sporty new crossover, and want something that stands out from the crowd, the Alfa Romeo Stelvio is worthy of consideration.